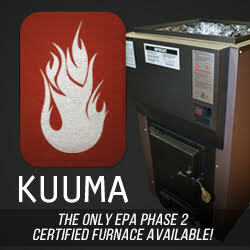 In the early 1980's pellet stoves were introduced to the US. Boeing Aircraft engineer Jerry Whitfield pioneered the first stove than uses sawdust waste for fuel. By using a compressed material that resembles rabbit food, a clean, renewable, carbon nuetral heating alternative was born. Whitfield learned about pellet technology in Europe and started working on the first project, a wood pellet boiler, in his garage. He even paid a local university to test it. The tests were successful and gave Whitfield a new direction. Wood stoves were a popular alternative heating source at this time, but they were getting a lot of bad press about their emissions and regulators were starting to crack down. With pellet stove emissions were only 0.7 grams of particulate emissions per hour, as compared to wood stoves at 50-100 grams per hour, it was a viable alternative for the mass market. "What better time to come out with something that still burns wood, that will save the day for a lot of People," he said. He introduced his first stove at the Wood Heating Alliance show in Reno, Nev in 1984. At the end of the four day show he had orders for 1,000 stoves. Whitfield's stove looked like a typical wood stove on the outside, but inside it was state of the art. With an auger feeding specific amounts of pelletized low moisture fuel, and adding combustion air at just the right level a clean, consistent, and controllable burn was established. By blowing the heat off of the stove the safety and efficiency was raised, and the back side of combustion air made chimneys obsolete. His first facility was a privately funded 1,500-square-foot shop in Lynnwood, WA. A short time later, he left Boeing. From Lynnwood, the company moved to a 15,000-square-foot plant in Everett, then in 1990 a 115,000 square foot plant in Burlington, WA. They manufactured up to 150 stoves a day during peak production. Discontinued this year the Whitfield IIT is the longest running and best selling stove to date. In 1999 Whitfield's company, Pyro Industries, was sold to Lennox International which was later reorganized into Lennox Hearth Products. Business as usual, was the pronouncement of the 100 year old heating company. Many changes and new products were rushed into production, and many difficult years followed. The leading industry and pellet stove design innovator began to fall and sadly the last of the stoves that were once Whitfield were discontinued this year as Lennox purchased Country Stoves, and abandoned the Whitfield legacy. Files attached from Popular Science 1984 - talking about the first pellet stoves.